The newly opened Greenhills Towncenter along Granada St. (adjacent to Gilmore and Ortigas Avenue) is the newest hangout in town. It’s a quaint commercial complex that houses a number of food establishments as well as several lifestyle stores. Since this is very near our place, my family decided to drop by one Sunday to check it out. As we entered the complex, we noticed some familiar establishments already such as “Sumo Sam”, “McDonald’s” and “Seattle’s Best”. But we were hoping to find something new. 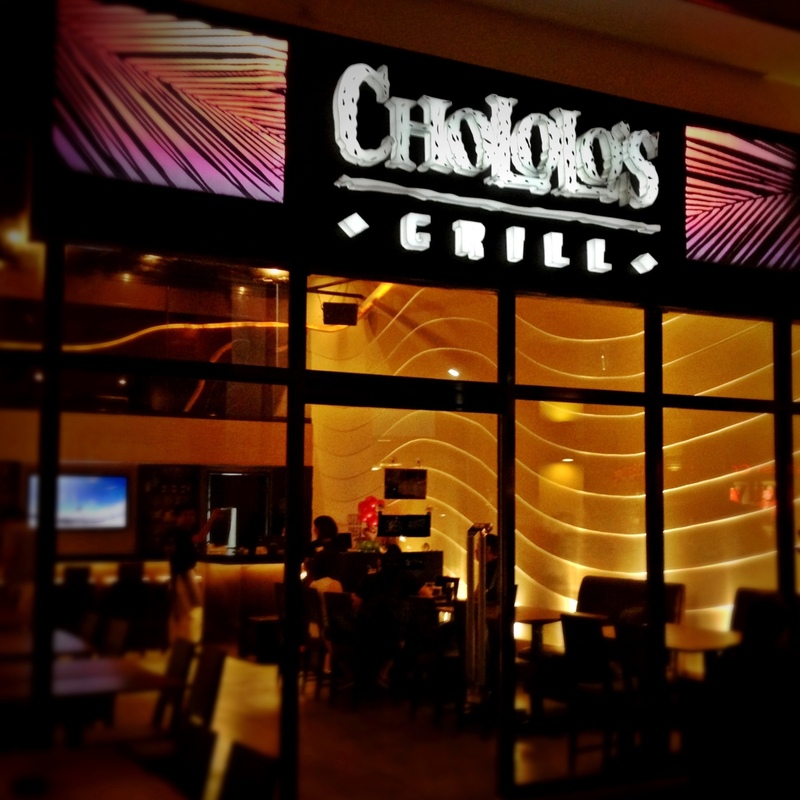 As we toured the small complex, this dimly-lit restaurant situated at the back of McDonald’s caught our attention. Panoramic shot of the interior. There’s actually also a 2nd floor for customers who want more privacy. As I went through their menu, I noticed that their list of offerings were more heavy on the barbeque and seafood fare. Lucky us! Those kinds of dishes are our favorite. 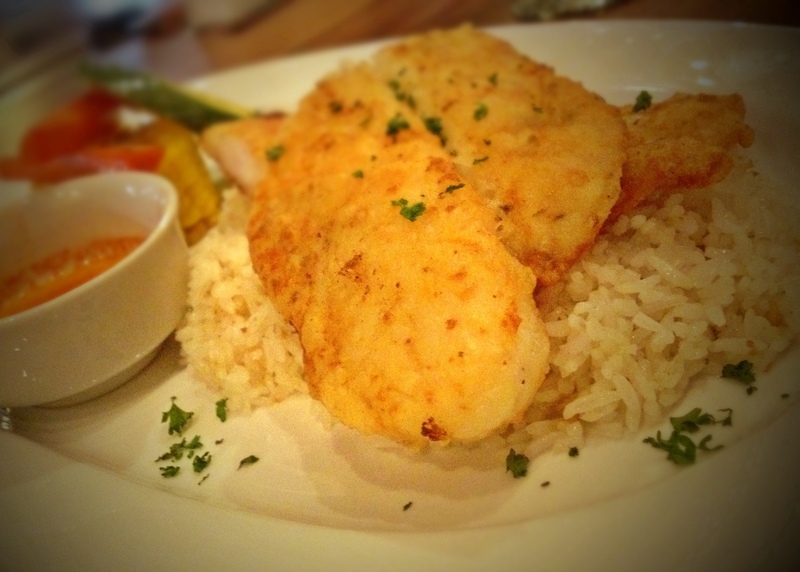 Dory Steak with buttered carrots, zucchini, grilled corn and garlic rice with a sweet and sour-ish dip for Php225.00. The fish was cooked just the way I like it – crunchy (yet not flakey) on the outside with meat that’s soft and moist on the inside. The Dory steak was a bit salty but it was alright since I actually liked it that way. The flavor complimented the garlic rice which seemed to actually have no salty taste. 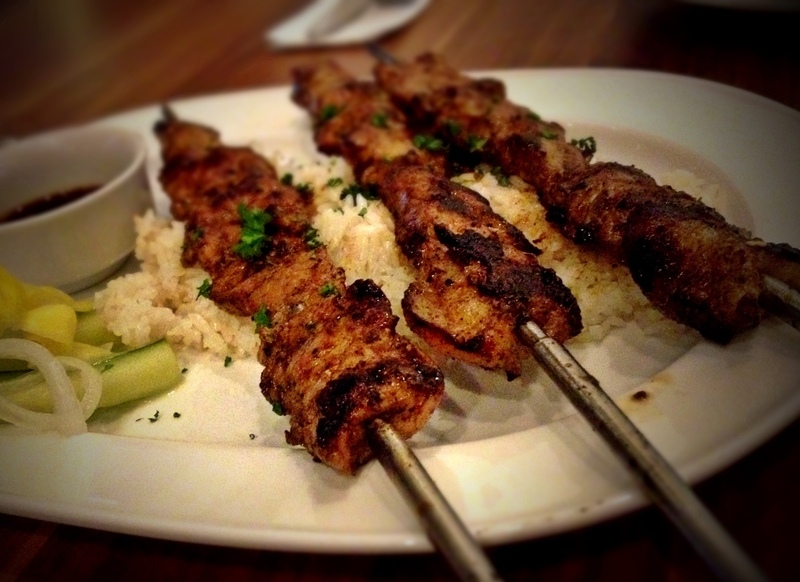 (3) Skewers of Grilled Jerk Pork BBQ with pickled vegetables served on a bed of garlic rice for Php170.00. This is not your usual sweet pork barbecue. It is seasoned with salt, pepper and herbs and tasted really great! 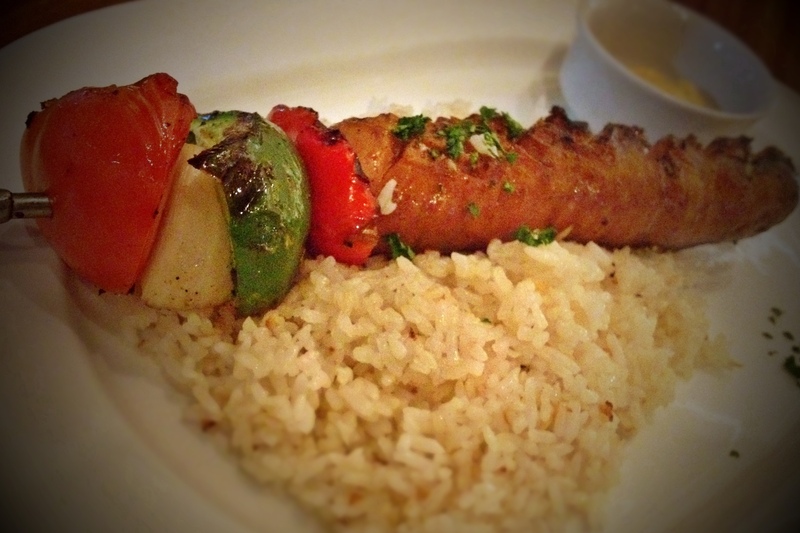 It pleasantly reminded me of Persian Kebabs. Sheer goodness! This Hungarian sausage was particularly served like a Kebab. It had an amusingly cute presentation! Hungarian sausages are naturally spicy already, so dipping it in mustard that came with it seemed a tad too much for me. But overall, it was still ok.
No, its not made of Ram meat! It’s just called that way. It was juicy and well seasoned. Nothing extraordinary, though. 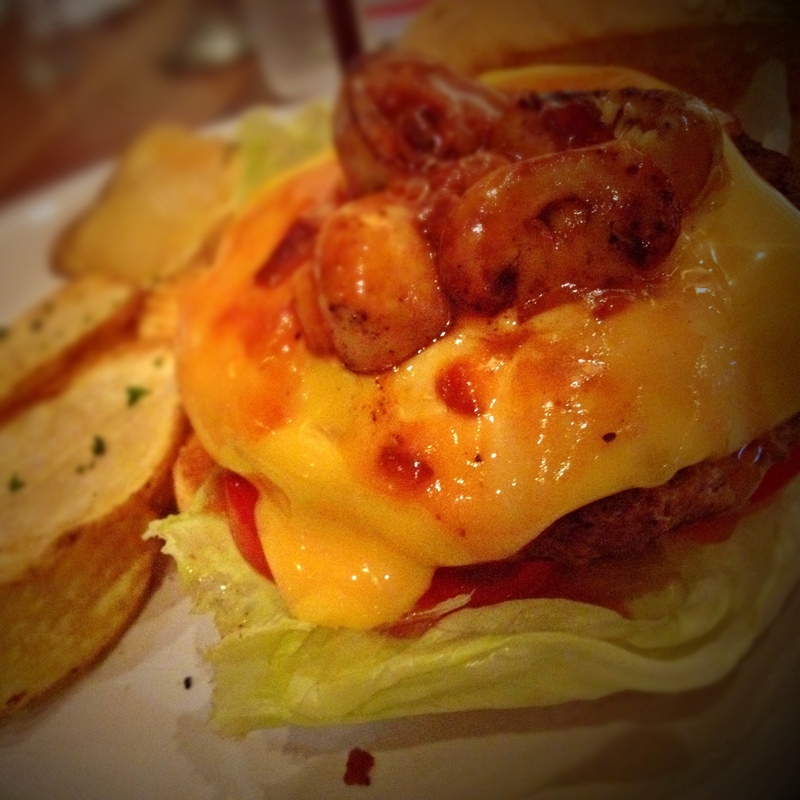 But if you are craving for a gourmet burger and tight on the budget, this little baby will do. -For those who don’t mind drinking house water… Tough luck. They don’t serve it. A small-sized bottled water is sold for Php35.00. -All prices are inclusive of VAT. -Corkage for alcoholic drinks = 50% of in-house bottle cost.